We face countless job opportunities throughout our lives, whether they be in the form of new positions, promotions, or side hustles. The trick to creating a life filled with meaningful work is knowing which opportunities to accept - and which to reject. During the past month, I've been mulling over an opportunity that, despite being a poor fit, was hard to let go. As I reflected on the (many) times I've said "yes" to opportunities that deserved a "no" - and then paid the price in the form of diminished well-being and less work fulfillment - I began to compile a "list to self" to help guide my future decisions. When it was complete, I realized the list might be worth sharing. 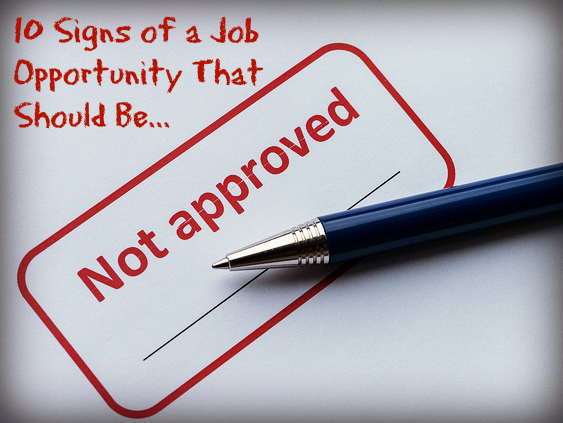 So here it is: my 10 time-tested signs of a job opportunity that needs to be turned down. 1. Your first reaction was negative. We know whether we want an opportunity within five seconds of hearing about it. Did news of the opportunity feel like a punch in the gut or a lift toward the heavens? Did your mind scream, "oh no!" or a joyful "Are you kidding?! Me?!" Did you want to run away or run and tell your neighbors? These snap judgments aren't throwaways; they're our real thoughts and feelings, as Malcolm Gladwell argued persuasively in Blink: The Power of Thinking Without Thinking. Just because we can't put the reaction into words doesn't mean it's worthless. In face, this unspoken quality may mean the feedback is even more valuable. 2. The opportunity feels heady. The first thing I thought when I entered the gorgeous atrium where my prospective teaching job would be housed was, "Whoa, this is heady." I had the exact same reaction five years later when I walked into the marbled lobby of the publisher who I was considering contracting for. In both cases I said "yes" to the opportunities. In both cases I deeply regretted it a few months later. Heady is just like the buzz of alcohol: it wears off. Rather quickly. The status or power or pay or physical setting may feel intoxicating. But when the real work begins, we're left with little more than a hangover. 3. Success will hinge on your less-developed abilities. It's terrific to want to develop ourselves and take on "challenges." I'm all for that; we'd stagnate otherwise. That said, success in a position must rest primarily upon our strengths in order for us to feel content and like the work is feasible. In other words, it's fine to take an opportunity that will cultivate a number of our underdeveloped abilities, so long as the key ability is our ace in the hole. Choose otherwise and we're setting ourselves up for misery - and failure. 4. The opportunity may make you re-prioritize your values. The best time to get in touch with our values is when life is calm and stable between opportunities. Once an offer's on the table, all sense of values tend to go flying out the door. That's because we humans tend to be awfully good at convincing ourselves that a promotion or job offer is great for us, whether due to fear, excitement, or people pleasing. "I don't really care about evenings with my husband that much," a friend once after she'd been offered a promotion that would require longer hours. This was the same person who, a month earlier, had been waxing poetic about the grounded feeling her hubby provided, and how much she needed that touchstone on a daily basis. 1) Getting to know our values - and their priority level - when no opportunities are on the table. 2) Being realistic about the ways in which a new opportunity may threaten those values. 2) Staying true to that prioritized value list, whatever the job cost may be. 5. Saying "yes" is solely about the paycheck. Speaking of cost, often the expense of saying "no" to an opportunity is quite literal. Yes, we all could use more money. We all could think of great ways to spend an extra few thousand or more. Some of us may even need the money to simply stay off of debt collectors' speed dial. That said, we need to be clear not only about our fiscal budget, but about our happiness budget. If the opportunity threatens to bankrupt our sense of well-being, it may not be worth the gained income. In sum, I've turned down opportunities worth at least the cost of my college tuition. Making these decisions felt a lot like band-aid ripping: painful in the moment, but then I was so glad they were gone. 6. Physical symptoms have appeared since the opportunity arose. While considering the opportunity recently laid before me, the stomachaches that plagued my childhood suddenly reappeared, I began waking up at 4am unable to fall back asleep, and I emerged from meetings about the opportunity with headaches that felt eerily similar to concussions. Granted, I may somaticize more than the bulk of the population - we INFs on the Myers-Briggs scale often do - but we all tend to experience some physical signs when we're going astray, however minor those symptoms may be. Think about it: if we're feeling ill just thinking about saying "yes," imagine how we'll feel when we're actually doing the work. 7. It seems too good to be true. Ah yes, the "there must be a catch" phenomenon. What holds in life holds at work. If the opportunity looks way too good and feels slightly unearned - e.g., a promotion well beyond what would be expected for this point in your career, a job whose high pay that doesn't add up to the low hourly requirement, a change that elevates you from managing no one to 300 people - it may be time to move on. Sure, some great-looking opportunities actually are. But have you gotten your Publisher's Clearinghouse check in the mail yet? Didn't think so. 8. "Everyone" says you "should" take it. The cardinal rule of creating meaningful work: beware of "everyone." Collective tends to be too hung up on extrinsic rewards and status updates to be helpful. The antidote: 1) identifying the people that get us on a deep level, and 2) only listening to them when we're in decision-making mode. In fact, I find it helpful to not tell anyone outside my (very tiny) personal board of directors that I'm even considering an opportunity. If friends and family don't even know I'm making a decision, they don't have a chance to weigh in. Problem of hearing from "everyone" solved! 9. The opportunity came to you, not vice versa. Some amazing opportunities simply fall into our laps. There is no denying that. Some absolutely cruddy ones do, too. One of my prospective coaching clients described the latter as "being derailed by opportunities." The ratio of amazing to cruddy for opportunities that come to me is about 1:20. The ratio of amazing to cruddy for opportunities that I actively seek out or create is about 1:2. When opportunities have made their way to us, there's a larger chance that they aren't aligned with what we actually want and need out of life. Instead, they often represent what someone else wants and needs - that they think they can get through use of our talents and skills. Right for us? Absolutely not. My mom always warned, "Throughout your life, people are going to see your potential and want to use it to suit their own purposes." Mom knows best. 10. You won't be living your sense of purpose. Speaking of purposes, if we are to stand any chance of knowing when to green light an opportunity versus when to deep-six one, we need to know what we're heading toward. Sure "purpose" is no small thing, and it can feel like an overwhelming entity to know. We'll be breaking purpose down in the weeks ahead, but for now what it boils down to is rather simple: What makes you feel fired up? What makes you feel "well used"? What makes you feel like you're building a legacy of which you can be proud? If the opportunity doesn't involve any or all of those things, then forget it. A superior opportunity will eventually come along. Or, better yet, we'll create it for ourselves. What did I miss? What would you add to the list, based on your experiences of choosing well...or poorly? !